Within moments of being in a mall bombarded with different music from all sides, I experience sensory overload and start searching for the nearest exit. Whales can’t escape the noise pollution in their world so easily. The effects of sonar testing by the U. S. Navy, seismic blasts by oil and gas companies mining the ocean floor and noise from ships create a constant acoustic assault on marine mammals. Hemorrhaging in the brains, ears, and eyes of whales caused by this barrage of sound is so painful that they heave their immense bulk upon the shore to get free. Once on dry land their organs are crushed by their own weight, and they die. I have been tracking this tragedy since the year 2000 when seventeen whales thrust themselves upon the shores of the Bahamas. The U.S. Navy denied any connection between the sonar testing taking place nearby and the death of the whales. Necropsies performed on the whales by marine biologist Ken Balcomb verified the cause of their death as “barotraumas,” which was evident in microscopic sheering and compression injuries to sensitive ear and brain tissues. The Navy then did admit that there was sonar testing taking place in the region at 180 dB (decibels) previously considered to be a “safe” level for non-serious injury to whales. However, with multiple submarines and ships sending signals at the same time, they admit the effects could have been intensified. Whales depend upon their super sensitive hearing for survival. The haunting song of the male humpback whale brings his mate to him and allows him to communicate with the pod. The noise level in the ocean can drown out the love songs of breeding leviathans. It also causes the whales to veer off migratory paths, established feeding stations and breeding areas selected for this purpose for millennia, thus threatening their very survival. Blasts of noise have caused whales to surface too quickly creating “gas bubble trauma” with effects similar to the bends in a diver coming up too fast. Use of military sonar has been associated with whale strandings not only on the Bahamas, but in Greece (1996), Madeira (2000), Vieques (1998-2002), the Canary Islands (2002, 2004), the northwest coast of the U.S. (2003) and Kaua`i Hawaii (2004) and Spain (2006). In 2004 and 2005 whale and dolphin were stranded or died on the coasts of Australia, New Zealand, North Carolina, and Florida after use of high intensity sonar. All of these sonic assaults on the environment were done in the name of homeland security. The U.S. Navy Fleet Commanders in Chief have determined that SURTASS LFA sonar is a crucial element in the Navy’s anti-submarine warfare. They state that it is highly unlikely 180 dB will cause injury to marine life. The Navy’s response to accusations of harm has been to deny negative impact and to spend 16 million dollars to prove it. If you go to http://www.surtass-lfa-eis.com you may see how they state their case. Top scientists were hired to conduct scientific research and develop an Environmental Impact Statement, including the development of marine mammal mitigation systems. The Navy states that the outcome of this research by the Bio-Acoustic program at Cornell University has not been influenced by the Navy. The problem is that having the Navy finance the research is a bit like paying the fox to investigate the hen house. One leading scientist compares Navy-funded marine-mammal science to tobacco industry-funded studies on lung cancer. The researchers are not directly influenced by the Navy, but they are inherently dependent upon government grants for other projects. The results of the studies sound good until you learn that the Navy refused to employ the mitigation tactics recommended by the researchers. In fact, The Coastal Commission in California, where deep canyons serve as migration routes for whales, had to sue to force the Navy to employ these very precautions. A U.S. District Judge ruled that they Navy will not be permitted to use its mid-frequency sonar within twelve miles of the California coast, a zone that is heavily used by migrating whales and dolphins. 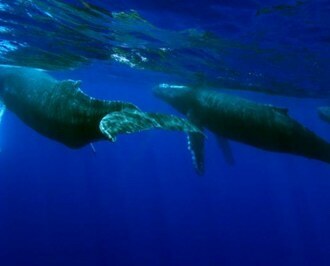 Sonar is also banned in the Catalina Basin, an underwater canyon with a high density of whales. The Navy will have to monitor for marine mammals from both the ship and from the air before and during its sonar exercises. If any marine mammals are spotted within 2,200 yards of the ship, the Navy will have to shut down its sonar. Ignoring vigorous objections put forth by environmentalists to sonar testing taking place in 80% of the world’s oceans, the U. S. Navy and others, continue to threaten the survival of marine mammals. Dr. Christopher Clark, of Cornell University’s Bioacoustics Research Program, has described what marine mammals face today as an ‘acoustic traffic jam.’ “The noisiest offenders are supertankers and cargo ships, whose propellers emit a pervasive low-frequency hiss, which penetrates more deeply in warmer water. The shipping lanes pretty much parallel the gray whale’s migratory route.” Dr. Peter Tyack, an expert on whale acoustics feels the greatest potential for ear injury is explosions, sonars, and the air guns used for seismic surveys by the oil companies. But, the most pervasive and most easily mitigated is the use of low and mid sonar frequency by all navies around the globe. The most pressing threat to ocean life today is in the environmentally sensitive shores of Hawaii. In 2006, President Bush announced with great fanfare that he had established the largest marine protected area in the Northwestern Hawaiian Islands. Bush said, “ To put this area in context, this national monument is more than 100 times larger than Yosemite National Park….It’s a big deal.” The Northwestern Marine Islands cover 84-million acres and are home to 7,000 species of birds, fish and marine mammals, at least a quarter of which are unique to Hawaii. Meanwhile, the Navy acknowledged in its Environmental Assessment for Hawaii exercises in the same region that its sonar will reach levels at up to 235 dB-at least a hundred thousand times more intense than the levels which stranded whales in the Bahamas incident-and that sonar will, at a minimum, likely significantly alter or cause the abandonment of the whales’ migration, surfacing, nursing, feeding or sheltering behaviors. War games are also slated in the Humpback Whale Sanctuary in the Main Hawaiian Islands. Recognizing that this is a violation of the Marine Mammal Protection Act, the Bush administration in January 2007 exempted the Navy from the law. In order to stop the flagrant refusal to observe environmental laws, suits were filed by environmental groups to force the Navy to respect laws in place. In Nov. 2007 they achieved a stay of execution for the whales and other marine mammals whose lives are in jeopardy. When the Navy announced plans for up to twelve sonar tests of Undersea Warfare Exercises during 2008 in Hawaii’s waters within the Humpback Whale National Marine Sanctuary, near the Marine National Monument in the Northwestern Hawaiian Islands, Dr. Marsha Green, president and founder of the Ocean Mammal Institute, came forward. In May 2007 Dr. Green, who has dedicated the last twelve years of her life to bringing this hidden problem to the surface, organized protests on Oahu, Maui and Kauai to create public awareness. All she is asking the Navy to do is adhere to the same mitigation recommendations presently being observed in California. So far, the Navy has turned a deaf ear on her protests and that of KAHEA, the Hawaiian environmental Alliance. It’s ironic that whale watching is a 500 billion dollar business globally, but that so few people are aware of the underwater assault upon cetaceans taking place for over a decade. The battle beneath the surface of the deep blue sea goes on unnoticed. A female humpback whale entangled in a spider web of nets and hundreds of pounds of crab pots nearly perished just outside the Golden Gate Bridge. She was rescued by a diver who worked for hours to cut her free. When she was free, she swam in joyous circles around him. Then she came up to him and looked him in the eye and nudged him gently as though to thank him for her rescue. The man said the connection he felt to this sentient being was the most beautiful experience of his life. The whales can’t defend themselves against us. 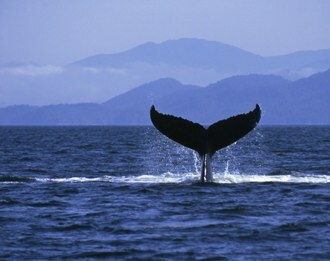 We need to remember in our urgent desire to protect our homeland that when the whales stop singing, it will be forever.